From 1786 to 1788, Goethe traveled through Italy on a journey of self-discovery and to escape his duties as a high-ranking civil servant in Weimar, the capital of the Duchy of Saxe-Weimar. 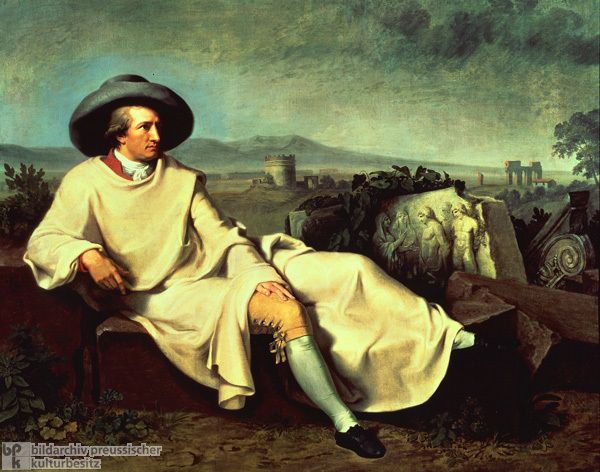 In the years following the publication of his celebrated Sorrows of Young Werther (1774), Goethe became a central figure in the literary and cultural movement known as “Weimar Classicism.” This famous portrait by Johann Heinrich Wilhelm Tischbein (1751-1829) shows Goethe amidst a landscape of Roman ruins. His surroundings highlight the perceived connection between German and classical Mediterranean culture. Oil on canvas, 1786-87.